I didn't knit that. It's a golf club cover. It's cheap yarn, ribbed all the way up, increased for the head of the club and then a huge pom-pom. My dad is a golfing fanatic. He is retired and travels around golfing with friends. A few of them have these and they were knit by some woman who is very smart. Guess what my father paid for three of these? No really, guess. $105.00. Seriously. Forget the fact that his daughter is a knitter...$105?!?! I told him to never ever buy one of those again. I will make them for every club he owns. $105?!?!? Okay, getting on to my own knitting... Remember this? It's Lizard Ridge. It's halfway finished and I've been working on it again. Love this pattern. The Duckies are coming along. I only knit them at school and since I only work part-time it's slow going. I should be to the heel flap on the second sock soon. Love the Lizard Ridge so far, and those socks are pretty and lacy and spring-y (I know that's not a word, but... it's appropriate). 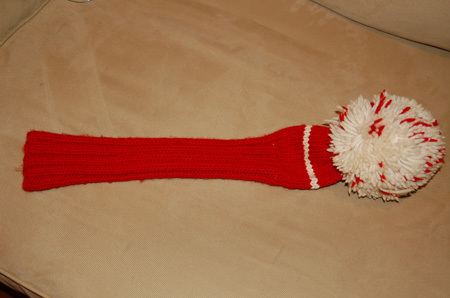 That golf club cover... it looks like the shaft of a very thin sock with a pom-pom on it. $105! You could make a killing knitting those up. Wouldn't take more than an hour per piece. Are you serious? $105???? Sheesh --- they should be made out of the finest merino for that price. I had to laugh that he didn't think about asking you to make some though. Pretty funny! Your lizard ridge is looking fab!!!! I love that pattern, but I am not a blanket person. I would get so bored. This page contains a single entry from the blog posted on May 4, 2009 9:19 PM. 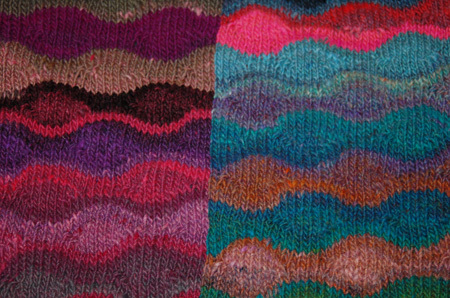 The previous post in this blog was Last non-knitting post. The next post in this blog is Back in the saddle.